Hey, Washington DC-area Acafans! Are you up for a night of awesome music PLUS doing good for the community? 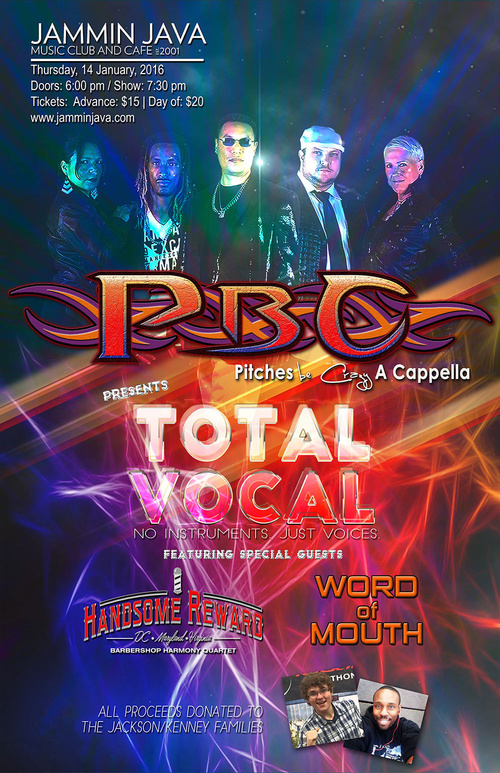 Come to Jammin Java (Vienna, VA) this Thursday, January 14 for TOTAL VOCAL featuring Pitches Be Crazy, Word Of Mouth, and Handsome Reward. The Pitches are turning this fun-filled show into a benefit concert to help support the Jackson/Kinney families. You can be entered into a drawing to win two (2) FREE tickets to this event. See details below! Pitches Be Crazy is an all vocal cover band rockin’ some of the biggest hits of the 70s, 80s, and 90s. Edgy and raw in their arrangements and presentation, they add those juicy harmonies, bone rattling percussion, and subharmonic bass, making PBC very unique across the a cappella landscape. Word of Mouth, a post-collegiate group, were the winners of DC’s first “Aca-Challenge” a cappella competition, They are a mixed all-vocal band with a serious passion for contemporary a cappella and a Peter Pan complex. 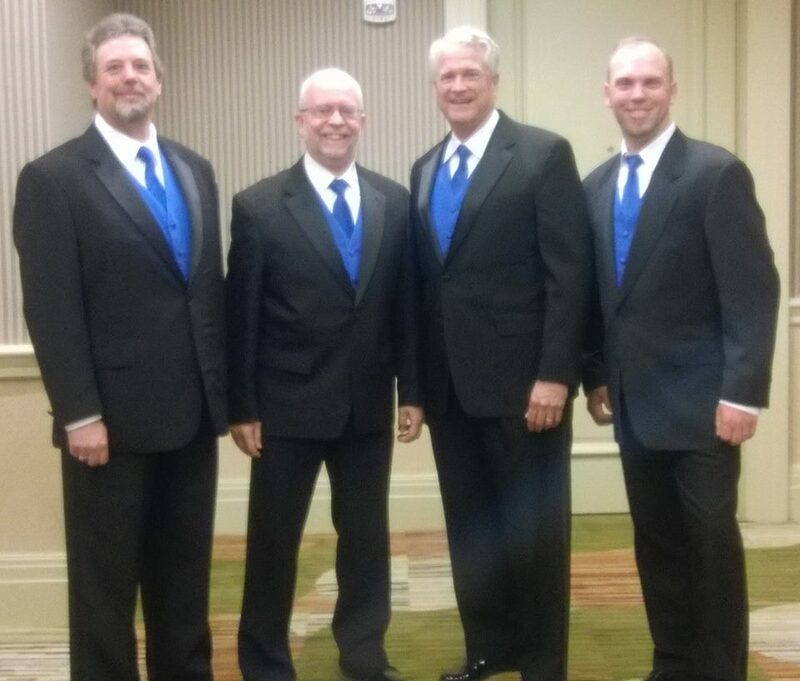 Handsome Reward is a four man barbershop group who are a spin-off of the large chorus out of Gaithersburg, MD known as Harmony Express. They also have members who are part of the famed Alexandria Harmonizers. Greg Kenney is an 18 year old young man who was once very active in the local community theater scene as an actor, singer, and dancer. He has a list of credits that rival many adults. An active member of his church and community, Greg has dedicated countless hours to his faith and has even spent time on a personal mission to support the church. An avid runner, Greg (or GJ as he is also known by), was running the Rock N Roll Marathon in Virginia Beach, VA in September. Close to the finish line, he collapsed with cardiac arrest. Fortunately, another runner behind him was a nurse and provided aid immediately. Half of the profits from this benefit will go to Greg’s medical fund. Jivon Jackson was named as one of the Top 40 Under 40 for supporting the development of their communities. He is well known throughout the DC, MD, and VA performance arts communities. A producer, director, writer, actor, singer, dancer, and mentor for youth, Jivon has been a force in the Southern Maryland and DC areas and has screen credits as an actor on cable television. Last year, Jivon was in accident where he sustained severe head and brain injuries. Half of the profits from our benefit will go towards an arts program that he chooses that will help to continue to promote performing arts in the community. These are great causes for AcaFans to support, so please check them each out, and give if you feel so led. To enter to win two FREE tickets to this event, please click on the link below, and enter via our Rafflecopter sweepstakes form. Entries close Thursday, January 14, 12:00 am EST. Winner must be able to attend the show at Jammin’ Java, Vienna, VA. Winner will be notified via Facebook Message, Twitter Direct Message, and/or email as soon as the giveaway ends. Even if you don’t win, you should still go. You need more a cappella in your life.